As I mentioned when we revealed this expansion, Infinite Diversity aims to boost the game in three unique ways. One of the most obvious ways that we can demonstrate this is with the dilemmas you'll find in this expansion. 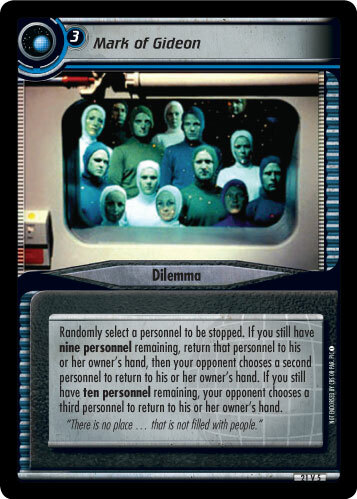 In any limited format event, you'll need a solid core of dilemmas upon which to build your dilemma pile. In an Infinite Diversity draft, you'll only need ten (10) dilemmas to make a legal dilemma pile, and you'll find nine (9) different dilemmas in each copy of Infinite Diversity - and eight (8) of those are brand new. So, you'll only need to draft one dilemma from your virtual boosters to have a legal deck - anything more is gravy (so to speak). The dilemmas in Infinite Diversity tend towards simple, reliable, small-scale stoppers - much like Dark Page - which will help all kinds of decks, but will be most beneficial in draft events or virtual events. A few of them are new variations on old favorites, like In Training. 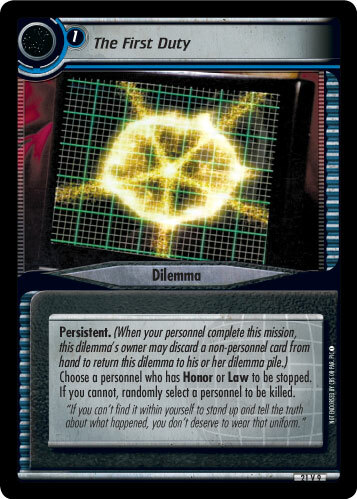 Two of the new dilemmas, Pillage and Plunder and The First Duty, are new variants of the classic "do-or-die" dilemma. No matter the format in which they're used, using these dilemmas will result in either a stop, or a kill. Ironically, these dilemmas are probably least interesting in draft format events. Some of the major complains about virtual format are the lack of dilemma diversity and the lack of low-cost dilemmas. These two new dilemmas were designed to specifically address the latter complaint, although because they are new, virtual dilemmas they also address the former. Essentially, these two dilemmas are mirrors of one another - one planet, and one space. They are both Persistent, which means that you'll be able to pull them back once the mission is completed. This is especially useful in the Infinite Diversity draft, because you'll have a number of events in your deck. So while these dilemmas may have been designed for virtual draft, I am of the opinion they will have a notable effect in constructed play as well. All three of these "do-or-die" dilemmas target new and rarer skills, which means there's a higher than average chance you'll end up killing a personnel. But even if you don't kill an opponent's personnel, you'll be able to set up more new combos than ever before. Pillage and Plunder can help you set up Captain's Holiday, which can be an effective stopper. Archaeology is not a common skill, so you're even more likely to kill a personnel against the affiliations that are light on Treachery - such as the Federation. The First Duty calls out one of the rarest skills in the game, Law, in addition to one of the more common, Honor. However, not all of the affiliations have Honor in equal measure. The Bajorans, the Federation and the Klingons have Honor aplenty, while affiliations like the Cardassians and the Romulans do not have much at all. Targeting Law can allow you set up Drumhead or Formal Hearing, on the off-chance it doesn't kill a personnel outright. To summarize, you've now got three more weapons to guarantee a stop (or a kill) in all of your decks. As we spoil more cards from Infinite Diversity, you'll see more and more of the weapons available for us in your next dilemma pile. There is a dilemma that forces you to attempt a different mission, a pair of dilemmas to prevent mega teaming, and more - even a dilemma that does something that no dilemma has ever done before! Stay tuned!